Home Décor theme from fmeextensions.com is a perfect theme for interior decors, carpet and upholstery sites, furniture and furnishing stores etc, and comes with a fast loading and user- friendly design scheme that can be easily customized as per your requirements. The homepage comes with extensive navigation and search options that allow you to easily display all of your featured product categories and allow users to easily navigate through them. A full-width homepage slider helps you easily create a slideshow of your featured products and banners. The rest of the layout comes in a 4 column grid along with an extension ready footer and sidebar. It also has an opt-in box for subscription management. The Home Decor theme comes with the below navigation options. A primary Megamenu allows you to include multiple columns of your product category links within a single menu item along with a provision to add a image, widget or a video clip. A separate Top menu has quicklinks to account management and shopping cart options. A keyword search box is also located in the header enabling users to easily do a quick search. The footer block allows you to insert quicklinks to your internal page in two different locations. It also has an advanced search facility where users can search with multiple attributes. The sidebar also has accordion styled menus which can be used for your product categories. Each of the individual product pages come with embedded Lightbox galleries which can support multiple images with magnification and scrolling features. Users can submit reviews, add product tags, email the page and can also add the product to a wishlist. They can also compare between multiple featured products. Embedded social media links in the header allow users to easily share a specific product with major social networking sites. The checkout page allows users to redeem discount coupons, and also has a embedded Shipping and Tax estimator extension which allows users to get a cost estimate based on the location details. The Magento admin panel helps you easily manage all your design, layout and e-commerce options with a complete ease of administration. The theme also comes with built-in extensions such as a shipping and tax estimator which gives an estimate as per the submitted location details. 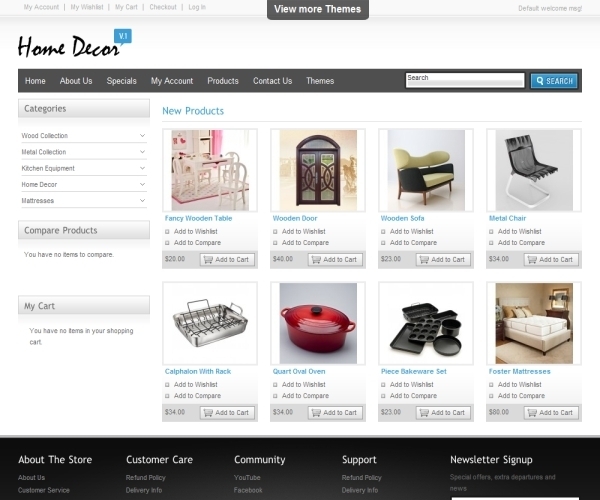 The Home Décor premium Magento theme is priced at $69.99.